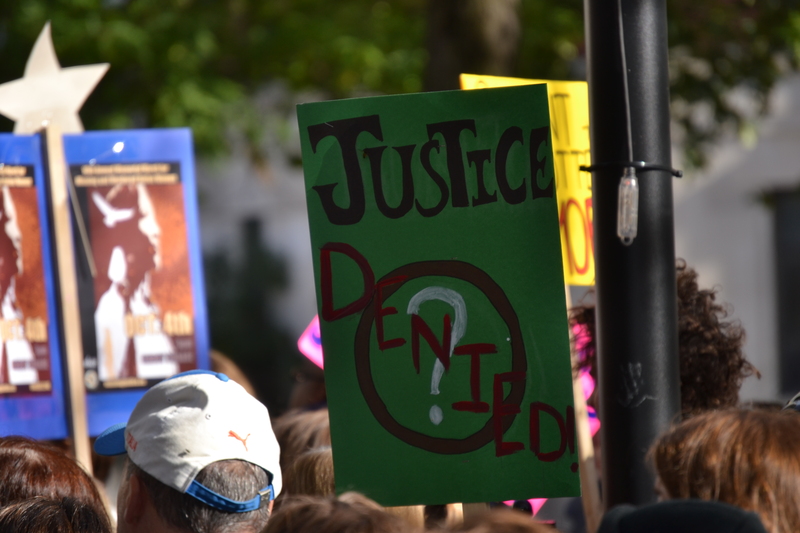 Hundreds gathered at Cabot Square on October 4 to demand justice and accountability from the federal government at the 10th Annual Memorial March and Vigil for Missing and Murdered Native Women. Called to action by advocacy groups Missing Justice, Quebec Native Women, and the Centre for Gender Advocacy, the crowd marched for roughly an hour and a half from Cabot Square to Phillips Square and was met with cooperation from the Service de police de la Ville de Montréal (SPVM). When the march arrived at Phillips Square, a vigil was held, with performances and speeches from Indigenous speakers and performers. Many of the speakers had lost a relative or close friend because of the systemic violence that afflicts Indigenous peoples. The upcoming federal election and its potential consequences for Indigenous communities in Canada was a major topic of discussion throughout the demonstration. One speaker from the Kanien’kehá:ka (Mohawk) Nation ended their speech with a call to oust Prime Minister Stephen Harper from office. “I am so tired of a man so smug that he can look at any one of our victims, any one of our missing women, and say ‘you don’t matter.’ Well I’m gonna tell Stephen Harper one thing and one thing only. And that is, Stephen Harper, you don’t matter. We are done with inept leaders,” the speaker said. “We need Canadians to stop with the apathy, to stop with the stereotypes. We need love. We need support, we need equality. Because everyone knows that good will always triumph over evil,” the speaker continued. Also present were a variety of Montreal-based groups that work with various Indigenous communities to provide services that help them connect with each other and the broader Montreal community. Megan Kasudluak, an Inuit participant at the march from Inukjuak, Nunavik, had recently arrived in Montreal and marched with a group representing Ivirtivik, a project that aims to help Inuit adults with employability and skills development, with a centre located in Verdun. Kasudluak told The Daily that the Ivirtivik centre has helped her enroll in school and find work, and is a great service for Inuit youth in Montreal. Speaking with The Daily, Wayne Robinson, an Indigenous activist and coordinator at Projets Autochtones du Quebec, expressed hope that recent initiatives taken between the SPVM and the Indigenous communities in Montreal will make life better for Indigenous people, who are disproportionately affected by violence and crime. “I think in Montreal we’ve seen an overall change [and an increased] understanding that Aboriginal homelessness is an issue that isn’t going away. [There is a] really cool project happening this year with the SPVM. We’ve signed an agreement where they’ve agreed to four points,” Robinson told The Daily. This agreement was signed by the SPVM and the Montreal Urban Aboriginal Community Strategy Network (MUACSN) and mandates the SPVM to create an Aboriginal Advisory Committee, choose an Aboriginal Liaison officer, enact a force-wide mandatory education program, and develop a protocol for addressing cases of missing and murdered Indigenous women. While the protocol is not yet finalized, the earliest parts of it include regular contact with the families of missing and murdered women during investigations and the creation of a support network for Indigenous women who arrive in Montreal with few connections and resources.